In music, a variation is “a formal technique where material is repeated in an altered form”. 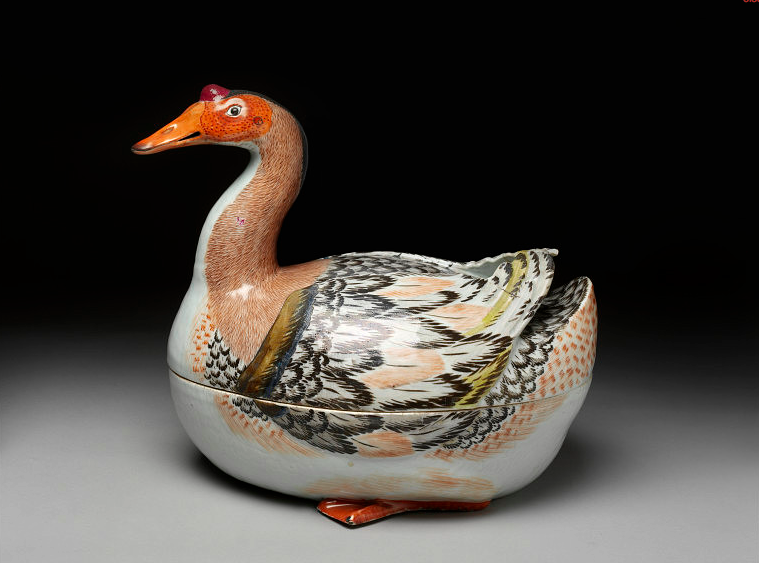 My theme is goose (Variations on Goose? –– what would Bach say?). This is the 3rd and final part of my goose trilogy. 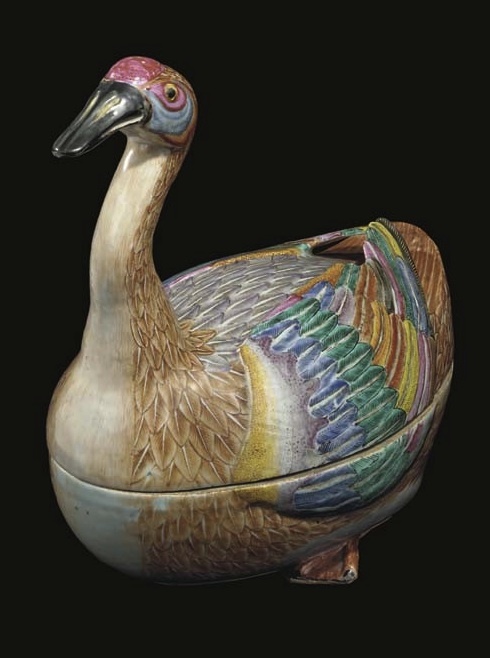 Variations can be visual, like these obscenely expensive and rare Chinese Export porcelain geese from the 18th century you see decorating this post, whose creators took the humble goose and delicately individualized each porcelain bird with a sophisticated rainbow of glazes in what was to be the last gush of Chinese imports before western pottery makers took over the market (what a pity, these are remarkable creatures). Variations can happen in cooking as well as art. I think my favorite creative cooking moments come when I latch on to a technique or an ingredient and run with it like those Chinese potters did. This often happens when I am introduced to a new ingredient or one that I have only used infrequently that finally captures my imagination. It makes me want to take it out for a test drive and see what it can do. Yes, it’s true, the goose made me do it. I struck up an email conversation with Jim Shiltz of Shiltz Goose a few months ago and got to play with a variety of goosely products. I have loved each one –– from smoked goose (see HERE) to the ground goose meatballs I made (see HERE) and now his foie gras. His foie gras is done without the traditional ‘finition d’engraissement’ (gavage). Instead, these geese are encouraged to be gluttons and they rise to the task admirably. As I’ve mentioned before, the whole idea for creating the gavage system was to mimic a natural proclivity of the goose to gorge. It was discovered that they would overeat prodigiously to fortify them for their fall migrations (a wild goose can nearly double its weight preparing for this flight). The livers of these geese were enlarged and absolutely delicious. The Shiltz goose liver was probably the most flavorful fowl liver I’ve ever had. I got 3 grades of liver from Schlitz. They go from normal size to a few times normal size. The color changes from red to pale golden pink. It is this last variety that I worked with for my recipe. It isn’t like the very fat and pale foie gras that I am used to. A test with some local foie experts agreed, although not as fat, it is incredibly flavorful (just like Jim’s geese). I wanted to do a riff (a Jazz form of “variations on a theme”) on the fabulous foie gras burgers that I have read about, made and loved. Thing is, once I made this burger, I realized the technique would work with duck of course, but would also make a luxurious turkey or chicken (using ground thigh meat) or even ostrich burger (you could use smoked chicken or duck in the mix–– even ham would work). I made the foie gras filling using my all-time favorite liver mousse recipe that I’ve used FOREVER. It makes the burger incredibly moist and flavorful. Since goose is delicious with port and port is delicious with Stilton I put them into the burger and loved it. I fed it to Dr. Lostpast (who only tried it because it was my birthday –– his initial reaction to my request was ICK, goose burgers? ), and he was shocked. They were delicious. The mousse and port jelly bathe the interior of the burger with a luxurious flavor that is really out of this world. I tried them with puff pastry shells and also with brioche buns (the classic accompaniment to fancy burgers) and liked them both ways. The recipe for brioche is from Martha Stewart and is truly the best I’ve found. 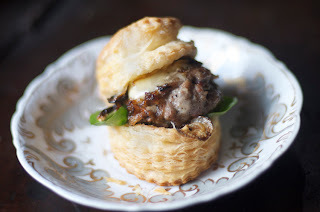 The puff pastry is my favorite recipe and rises like a dream (recipe is HERE ). These little burgers are very rich and are best when made small like a slider in my opinion. Make 16 to 48 flat paddies with the goose. Top half of the patties with a spoon of the liver and a small spoon of the jelly. Top with the remaining paddies and seal well, but do not handle too roughly (compression makes them tough). Fry at medium heat or grill until cooked (as for a MW burger). Top with Stilton just before removing from the heat to melt it a little (using lid of pan) and place on bun with onions and serve. Saute the goose liver and shallot with the goosefat or butter. When the liver is just about done, add the thyme and mustard and the liquors and stock and reduce a little. Put in the blender with the cream and Worcestershire and blend, adding more cream or stock if it is needed. Chill till hardened. Reduce port, add the demiglace and currant jelly and warm. Remove from the heat. Combine milk, sugar, yeast, and 1/2 cup bread flour in the bowl of a mixer. Mix until just combined. Sprinkle with remaining 3/4 cup plus 2 tablespoons bread flour, the all-purpose flour, and salt to cover; do not mix. Let stand for 45 minutes. Using the dough-hook attachment, mix dough to combine. Add 4 eggs, and continue to mix until dough is smooth and does not stick to sides of bowl, about 5 minutes. Mix in remaining egg. Add butter, 1 tablespoon at a time, mixing until incorporated. Continue mixing until dough is smooth and comes together in a ball around the dough hook, about 5 minutes more. Coat a large bowl with cooking spray. Transfer dough to bowl, and cover with plastic. Let stand in a warm place until doubled in volume, about 1 1/2 hours. Punch down dough, and re-cover. Refrigerate for 1 1/2 hours. Punch down dough again, re-cover, and refrigerate overnight. Preheat oven to 425º degrees. Turn out dough onto a lightly floured surface, and punch down. Working in batches (refrigerate remaining dough as you work), evenly divide dough into thirty-two 1-ounce pieces. Punch down each piece using the palm of your hand, and press each into a tight ball using the heel of your hand. Butter small Turk's-head or similar shaped cast-iron pans. Place 3 dough balls each inside molds (dough should fill three-quarters of each mold section). Or, make simple buns on pieces of parchment on sheet pans. Loosely cover pans with plastic; let stand in a warm place until dough balls are soft and springy to the touch, about 30 minutes. Lightly brush tops with egg wash. Bake for 10 minutes. Reduce heat to 350 degrees, and continue to bake until tops are dark gold (time will vary depending on size of pans or the bun size). Remove from oven, and immediately remove brioche rolls from pans and transfer to a wire rack. Let cool completely. Thanks to eHow for including my gooseburger on their Burger Emporium slideshow. I had better go and buy a lottery ticket, I want a Goose Tureen!! Wow! This is like the ultimate luxury food! I'm salivating! "Goosely products," eh? I love goose, too, but, like Diane, find it so expensive when buying enough to feed my hungry horde that I only buy it for Christmas every few years. 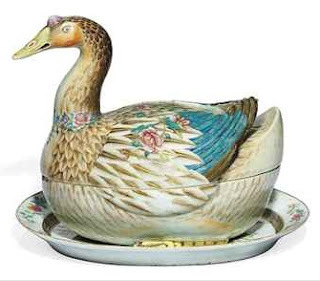 I have a mini goose china box that one of my boys bought me for Christmas a number of years back. It's nowhere near as fancy or pricy as the ones you show, but it's priceless because my son gave it to me. What a gourmet 'burger', Deana. There should be a finer name for it :) You amaze me every time with your selection of intriguing and delightful recipe! 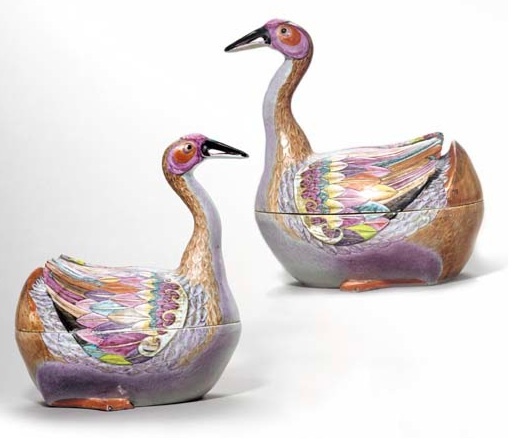 Oh my goodness, those are some expensive geese! Can you imagine how much their livers would cost :)? Living with you must be like a party every day! “Oh, ‘crise de foie,’ that French sole was so delicious!” penned Julia Child. The saying would be apropos for your gooseburger. Deana, you slay me with your fantastic recipes. Those are just wickedly decadent. Would love to give the puff pastry a whirl. I've been playing around with my puff pastry recipe. Just an awesome combination. This post is chock full of fabulous recipes. Sheer luxury. I've made MS's brioche..divine. I've also made a port jelly which we served with our wild duck. But I've never made your mousse and loved the recipe. Your photo of the puff pastry is a killer shot. The goose info is fascinating. Wish my dad was alive so I could copy this for him. The burger with stilton and the brioche bun - my tastebuds are quivering just thinking about it! A nice selection of dishes and great variation! Must use the port onions in somethign soon! YOU A.R.E. amazing. I chuckled loudly at your description of these gluttons, "...rising to the occasion, admirably!" I actually "knew" a goose on a farm near us in Massachusetts that we lovingly named GANDOR. He was one pig. He was ENORMOUS and would not let the other geese eat! HIS EYES WERE SUNKEN IN! HE HAD A LETHARGIC look on his GUELE and we once drove to check up on the gaggle. He would NOT let us get out of the car and we were cornered! teeheee...great memories. NOW for this recipe. Holy cow, this sounds outrageously fabulous dearest!!! You are brave, an artist, a MUSICIAN with food. I have got to at least SHOW this to my husband and next time we are somewhere more trendy than Minneapolis, we must seek out these burgers. your posts are always well researched and interesting, your recipes, decadent and inspiring - i enjoy reading them very much! Now I know what to do with a goose! And I will be asking for livers. The Hutterites will know I have gone batty! Sounds delicious. OH what a wonderful meal!!!! I want to do it now! Maybe for mother's Day which is here on March 21st. Plus there is a man here who raises geese for foie gras and his is real good too! Love what you do and your exquisite taste. You are one of a kind! The very idea of a "goose burger" shivers me timbers, but I enjoyed, as always, reading your blog. I love goose. And foie gras. This burger sounds absolutely incredible. My favorite brioche in the whole wide world is Thomas Keller's recipe. 20 tablespoons of butter will make anything delicious. This is incredible - SO rich, but SO ka-pow. I want. I want, I want. Also I like that the liver is from geese who gorged themselves and weren't force fed. 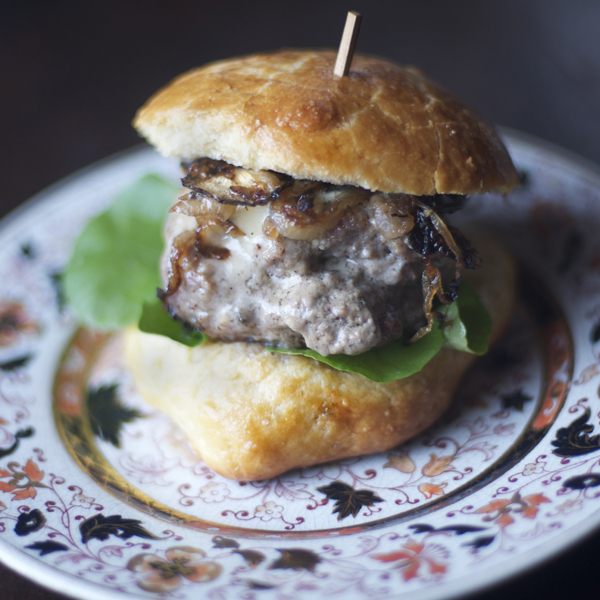 Oh what I would have given to attend a tasting of these little goose liver burgers. Luxurious! hmm... fresh view on burgers lol. Ive been having alot of fun cooking lately, and all because of Papas Burgeria Game, Goose burgers is something im seeing first time though, I just have to try it!